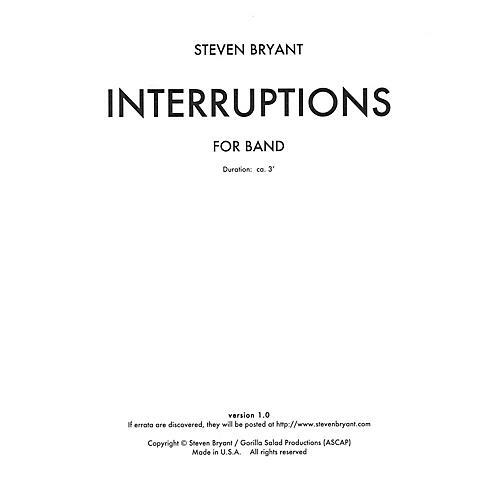 Interruptions is a new, shorter version of one of Bryant's earliest works, Interruption Overture, and is filled with quirky humor and musical mayhem! The music begins with a lively melody using familiar, comfortable harmonies, but is soon interrupted by abrupt dissonance. The music resumes its earlier character, but these loud interruptions rudely reappear, and the music begins to take abrupt turns through different tonalities. The work finally settles into a four-on-the-floor groove, as the opening melody and the interruptive material learn to coexist, leading to a climactic conclusion. A thoroughly enjoyable work for young bands!